Human relationships have always mattered. The problem is that they’ve just not always fit well into the social and organizational structures that have existed. However, as the world becomes smaller through the agency of technology, our relationships within those social and organizational structures rise in importance. They begin to eclipse the artificial boundaries that those structures have historically used to guide human behavior and interaction. One of the ways we can see this trend is through the practice of gratitude. The fourth action of gratitude is to Honor Others. It may appear on the surface that I’m thinking primarily of recognition of the sort that is given at an awards luncheon. That is one way of honoring others. However, in actuality, I’m thinking of something much different, much more fundamental to our relationships. When I first identified the Five Actions of Gratitude, my sense of what honor meant had to do with recognition for life or work of distinction. Like the Congressional Media of Honor or the Irving G. Thalberg Award on a more personal, local level. However, the more I’ve thought about this, the more I came to see that honor is a fundamental attribute of all healthy relationships. At the heart of honor is respect and good will. This of course is not always easy because there are many people for whom respect is not deserved and good will a wasted expression. 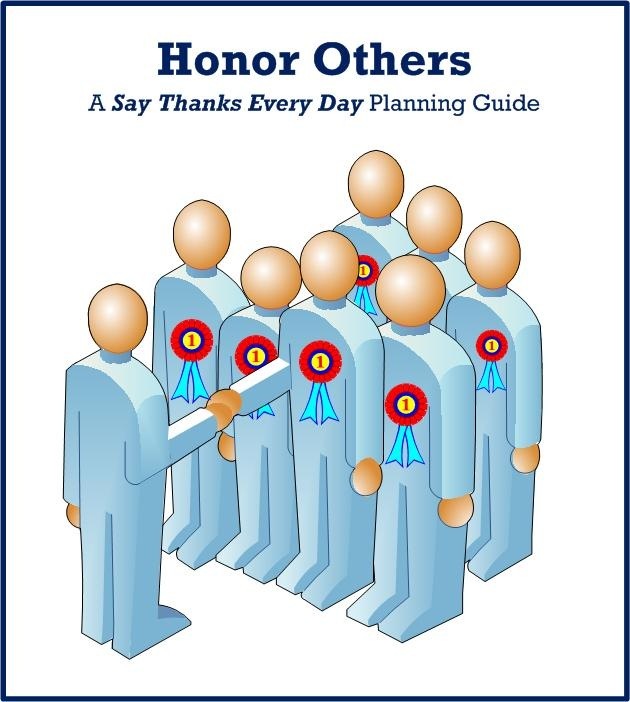 Yet, if we look at most of the social and organizational settings that we are in, and see respect and good will as a basis for how people relate to one another in those contexts, we can see how it is a short step to practicing a type of honor that has a transformative effect upon a team. Recently, as I watched a documentary on Russian film maker, Andrei Tarkovsky’ filming of The Sacrifice, he spoke about his approach to working as a team on the set. It is very important, and at the same time, very hard, to make set design, and camera man, and all the others working on the film into partners, collaborators in your plan. It is essential that they should not be in any way mere functionaries. They have to participate as creative artists in their own right, and be allowed to share in all your feelings and thoughts. Imagine the team that you work on being like this. Your work, your participation, your creative artistry, your ideas, feelings, purpose and commitment all mattering to the performance of the team. This requires the leader to honor each person as a vital contributor. Honor in this sense transcends what it means to recognize a person for a significant achievement. It is a change in the relationship between the leader and those who are led. Here’s another piece from Tarkovsky that describes this perspective. It is possible to move mountains when people, working together to realize the conception of the film. All with their different characters, temperaments, ages, and life histories are united as one family, and fired by a single passion. If a genuinely creative atmosphere can be built up in the team, then it ceases to matter who’s responsible for any one idea, who thought of that way of doing a close up, or panorama, who first devised a lighting contrast, or camera angle. 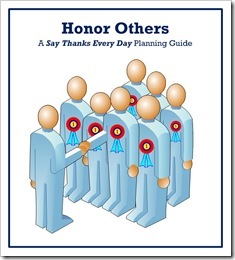 When honor takes root in an organization, a unity and common sharing begin to take place. One of the earliest descriptions of this type of team was by the Apostle Paul two millennia ago. Using the metaphor of a body, he speaks about a congregation of believers in a way that is similar to Tarkovsky. Now, while Paul may be speaking about a spiritual community, the idea that the relationships in any social or organizational environment could function in this way is not beyond the realm of possibility. We can all pinpoint situations where a person whom many people thought had the least ability or talent to offer makes a difference that matters in the course of a project. It happens all the time. What both Tarkovsky and Paul are suggesting to us is that honor is a function of a team where unity and high performance go hand in hand. To understand the practice of honor in this way means that we may have to change the way we look at people. In particular, those who are the most belligerent, annoying, negative, cynical and deceitful. It isn’t that we deny that they behave in a destructive manner. Rather it is that we believe that within them there is a better side. We don’t reach that better side by being just nice and complementary. Instead, we reach that other side by creating structures that create the kind of relationships that we see in Tarkovsky and Paul. In the Circle of Impact, we develop social and organizational structures in one sense to protect the relationships that constitute the group, team or organization. We d0 so to provide a foundation for unity and collaboration. Yes, I am suggesting that these structures have to be redesigned to support values like honor, respect and good will. We do this together, in conversation, defining what those structures look like. If you have been following this series, you know that a few weeks ago, I posted a guide called The Circle of Thanks. On that page, there are four categories of relationships that we may have: Family, Friends, Work relations, and those people who are Influencers in our life or work. Now take that list, and ask yourself how you can honor each person. What are the talents, the expertise, the values or expression of personality that you want to recognize and elevate as important. This is a way to begin to change the way we relate to someone. It is helpful to understand that the person who is negative and quite difficult to work with is also telling you want they value and even, love. If they are always complaining about not being respected, they are telling you that they want to be respected. So, look for something that you can identify that is worth respecting in that person, and do it. Thank them for their attitude or behavior. What you may find is their demeanor changes because, finally, someone understands what they have been trying to communicate. It is also important to recognize that the common use of honor in our society relates to people who have sacrificed on behalf of other people. This belief goes back to the days of Homer’s Greece where the person of highest esteem was the one who sacrificed the most for their community. Do not forget to recognize those who fall into this category. Many of them do not want to be celebrated as leaders. They do want to be thanked for their contributions to the people and the organizations that matter to them. As you do recognize them, it may be helpful to craft your honor statement by recognizing three aspects of a person’s motivation. One is that their actions are meant to be Personally Meaningful as they are based upon values that matter to them; Socially Fulfilling because the people in their social or organizational environment matter to them; and, Make a Difference that Matters as a contributor. Thank them for this in a genuine and authentic manner, and you’ll begin to create a foundation of honor that can spread throughout your organization or community. Tagged with Andrei, body, Congressional Medal of Honor, Five Actions, good will, gratitude, honor others, I Corinthians, Irving G. Thalberg Award, Paul, relationships, respect, Tarkovsky.